The Vice-President of the Regional Government, Manuel Jiménez Barrios, visited the FTE campus together with other distinguished members of the Andalusian Parliament and national M.P’s. 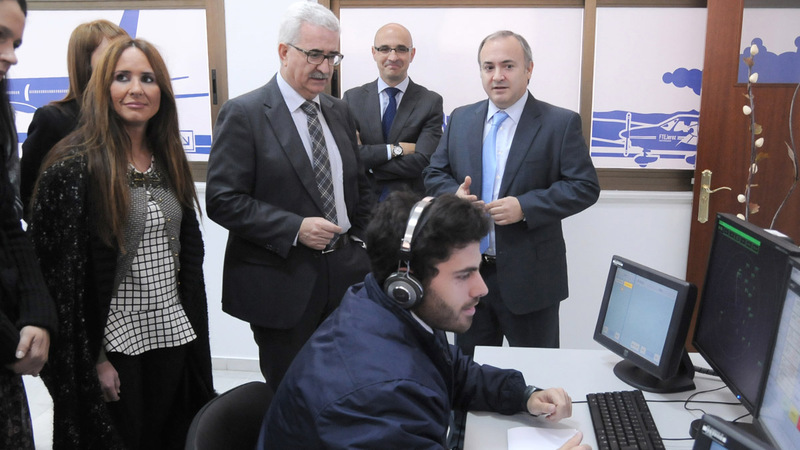 During the visit the Vice-President was shown around the facilities including, amongst others, the school’s aircraft fleet, flight simulators and ATC Radar Room. This institutional visit comes as a result of FTE’s recent award as ‘Best Business Services’ at the prestigious ‘Andalusian Business Excellence Awards’ and its standing in the international aviation training industry, attracting international students and renowned airlines companies to its purpose-built Aviation Campus in Southern Spain. Mr. Jiménez Barrios said that “the fact that one of Europe’s leading pilot and ATC training schools is based in Jerez, Spain, is something to be proud of”. The Vice-President added that “FTEJerez, with its state-of-the-art facilities and highly qualified staff is, without doubt, a key player in the region’s aerospace sector and is an essential contribution towards the socioeconomic growth of the province”. Oscar Sordo, FTEJerez CEO, stated: “It has been a pleasure welcoming the Vice-President to FTEJerez. His genuine interest in our organisation is much appreciated, as are his compliments regarding our operation”.